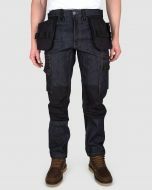 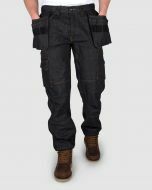 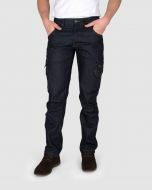 Five pocket style denim trousers with removable nailpockets made of 14,5oz stonewashed denim and CORDURA® at knees and nailpockets. 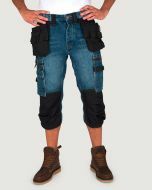 Legpockets with integrated rulerpocket and knifeholder, hammerholder and kneepockets for kneepads. 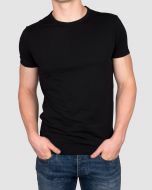 Normal waist and straight fit.